Make My Wish Come True. Only if it was that easy, some say. Believe it or not, your wishes can come true. With a little help from our friends at Get My Wish. Get My Wish is a website that promotes caring. Many of us overlook the compassion in others. We get so caught up in social media that our communication with our friends and loved ones becomes so obsolete. That is why the CEO of Get My Wish Paula, decided that there was a way to make things more meaningful that really can make an impacted in the world today. Have you ever thought to yourself that this Holiday season, I don’t need much? I certainly have. There has been plenty of times even before the Holiday season begins that I think of ways to give back to the community and support the causes that I’m most interested in. Granted, many of us can’t give as much as we would like to. Although, sharing your Free profile to your friends and family members can certainly bring attention to what you’re most interested in. On the Get My Wish website, you can create the only social media profile that really CARES about any issues and causes that you may want you’re friends and family members to know about. Creating and sharing your profile makes more of an impact and it helps others. It will help change their attitudes, compassion, but most of all, supporting the causes that are most dear to your heart. When you create a free profile with your interests, you can add a wish list in it with your Gifts (products that give back to charities in our partner’s area) and Causes (social issues you want to support). Setting up your FREE profile is so easy to do. Create your profile, add gifts or pick a cause and share to let others know you care. Simple right? So tell me, What do you really CARE about? Which causes do you support? Do you care about Poverty, Animals or Clean Water? But wait! Our friends at Get My Wish are making one reader’s wish come true. 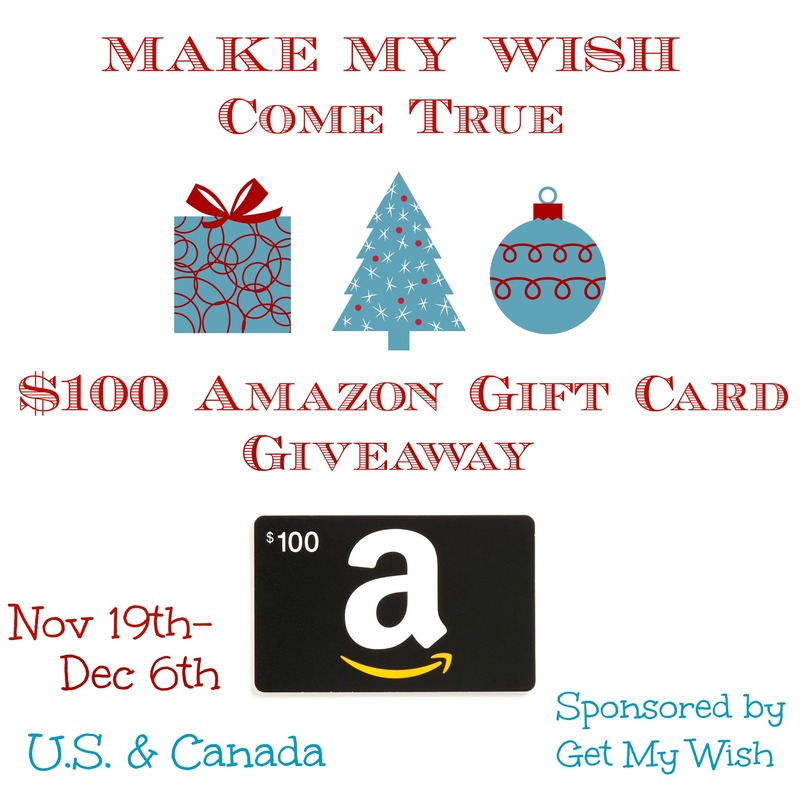 Come enter to win an $100 Amazon Gift Card! Be sure to create a profile and share your causes that you support. Enter this giveaway through the Giveaway Tools Form below. Giveaway is open to U.S. & Canada residents, must be 18+ to enter, ends on December 6th. Good Luck! Sunshine and Flip Flops and the blogs participating are not responsible for prize fulfillment/shipment. Sunshine and Flip Flops received monetary compensation for the hosting this giveaway. Facebook, Twitter, Pinterest, and any other social media are not affiliated with this giveaway. If you have any questions please contact the host of this giveaway event Michele at mdickerson316@gmail.com. My favorite activity to do during the holiday season is baking and making healthy treats for family gatherings. My favorite activity to do during the holidays is to watch a lot of movies. I like to relax during the holidays. Eating a lot of good food is another favorite thing about the holidays for me. can the winner choose the amazon gift card for amazon.ca? I love to eat and nap for the season. I buy Filipino food and desserts since I don’t know how to make them at home. At the same time, my family prepares a midnight feast which is common practice to the Philippines, for Christmas and New Year. I also like to watch the changing LEDs on my live Christmas tree as it is very fascinating and beautiful. When it snows, I like to watch the snowflakes falling from my window. These are special and simple moments that I enjoy the most at home during the holidays, more than parties or shopping. My favorite activity, is decorating the tree with my grandkids. My favorite activity to do during the holiday season is to shop. My favortite thing about the holiday season is spending more time with family! favorite activity is time off!! Bake cookies!!! This was always my favorite!! I always made some with my mom and my grandma!